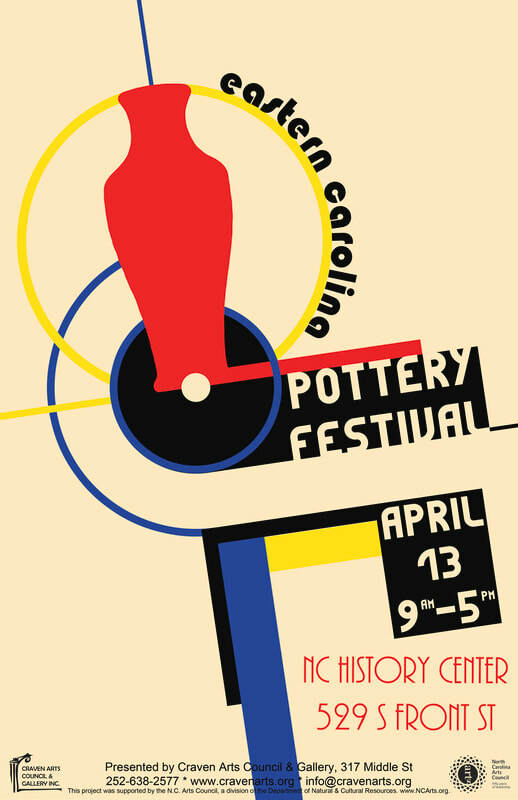 Join us for the 11th annual Eastern Carolina Pottery Festival at the North Carolina History Center from 9am to 5pm on April 13th, 2019! Featuring more than 30 vendors, this festival offers the public a unique opportunity to meet the artists, learn about their craft, and purchase works directly. Free and open to the public, come see work handmade by craftspeople locally and across the region. Originally organized by local potter and glass artist Rich Daniels, the Eastern Carolina Pottery Festival has grown to become one of the largest in our region. Ceramic artists from up and down the East Coast participate in this one day festival, showcasing their unique works to the public. Each potters’ unique style shows in the variety of techniques and designs, including raku, sgraffito, slip trailing, enamel, glazes, and artistic uses of mixed mediums. This year’s festival will feature a demonstration and education area, raffles, food trucks, and a limited number of high quality craftspeople in addition to the ceramic artists. The festival is an excellent expose of the quality of work and diversity of style in the field of contemporary craft. Potters include Sue Weisenberger, Christine O’Connell, Rebecca Shelby, Erika Gibson, Katherine Petke, Scott & Donna Haines, Alessandro Cagiati, and many more.